Significance of sacrifice: Parents should tell their kids the significance of sacrifice in order to make their religious obligations strong. Apart from religious obligation, sacrifice on eid ul adha also gives the lesson of strong faith that the Prophet Abraham (A.S) owe. Parents should teach their kids that they should surrender at any cost before the will of Almighty. They should guide their kids by exemplifying the faith of Abraham (A.S) that Allah sent a sheep for his sacrifice and spares his son. This was the incident that gives us many lessons like the lesson of faithfulness, lesson of Mercy, Lesson of obedience etc. All the kids must know about this story of sacrifice because it will create and flourish obedience of a man in front of his God. Kids will also make their faith strong and will not fear to do any thing for the willingness of Allah. Feel for poor: People who belonged to low class or have low socio-economic status should not be neglected on this day specially. Parents can guide their kids by telling them the significance of equality-and that the meat should be divided in equal parts (according to Islamic way) after the sacrifice of the goat, cow, camel etc on eid ul adha. The poor and needy deserve to eat the meat too because all are equal in the eyes of Islam. Family and friends: As Islam gives the lesson of equality, so there is also the part of family members and friends in the meat of sacrificed animal on eid ul adha. Parents tell their children not to fill their refrigerators with the whole meat but also distribute it to those who deserve it. It will make the terms and relations more strong between the two. 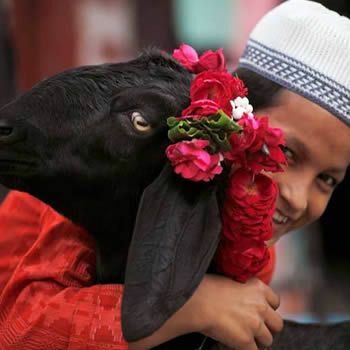 Care of the animal: Parents should tell their kids the significance of the animal that is being sacrificed on the day of eid ul adha. That animal will help us to enter heaven on the Day of Judgment. So, it is the duty of parents to guide their kids in this aspect-and tell them to love the animal and to take good care of it. Don’t harm the goat or cow by hitting them with some sort of stick. Feed them on time and also arrange some shelter where they could rest easily. Avoid Mess: After offering the sacrifice, parents should tell their kids not to throw the bones and other body parts of the animal everywhere. All the meat, bones, intestines etc should be kept on their right place. The blood should be washed off at once because it can make the small kids frightened.